If you are a cruise ship passenger, your ship will bring you to the dock in Ketchikan.I will arrange your transportation via the local cab company in advance of your arrival. Please depart your vessel as soon as allowed. There are two pick up locations designated by the Cruise Ship authorities. Based on your arrival time and Vessel; this varies and I will let you know prior to your trip exactly where to go. The cost of the transfer for up to six passengers is $35 which you are responsible for. Rental cars are available and there are numerous lodging options in and around town. Knudson Cove Marina also has very nice rooms available, but they sell out fast. As a service to my guests, I have pre-booked a limited number of dates in June, July and August. Call me today to check the availability of these dates. 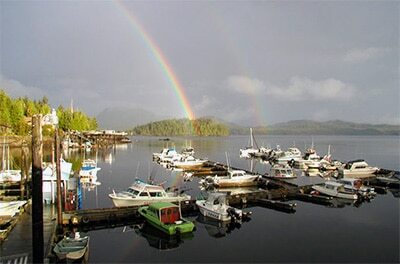 Check out Knudson Cove’s facilities @ www.knudsoncovemarina.com or call at (800) 528.2486.